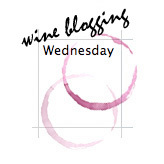 In the first moment I thought, wow, what a great theme for a winetasting!! Immeditiately I was thinking about some nice bottles South African Shiraz still waiting in my celler to be opened. On the other side wine blogging wednesday gives me allways the opportunity to buy and drink wines I usually won’t even think about. So the bottles still remain in the cellar an I got some fresh new world wine shiraz. Low budget might be interresting I thougt, so I went to the supermarket to check what they can offer! In german supermarkets it seems to be Australia is the mainprovider for cheap Shiraz, so I got 2 of them!! A short moment I was thinking about the fact of new wine world. In the matter of Cabernet Sauvignon, Merlot, Sauvignon blanc or Shiraz, I would say Germany could call itself as a new wine world country, of course german winerys are picking up more and more experience with this grapevarieties and are doing quiet well!! 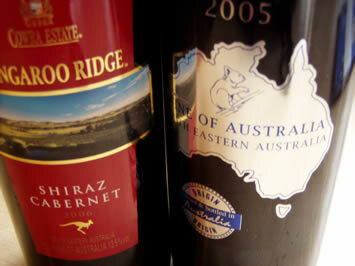 But I won’t be to exotic, so I stay with this 2 Australian wines. Drinking this wines, I wonder what happened the last 20 years with the Australian wineindustrie. I never will forget, my first time meeting Australian wine. In the mid 80’s at the winefair Interwine in Frankfurt, Australia had its first showing up in Germany. At this time it was a real sensation getting wine from down under, and, the wines have been unbelievable expensive and of a shocking high quality. This few Australian wineries has been the sensation of the winefair, not knowing at this time what a great success Australian wine would be within the next 20 years. I still have this Kangaroo-pin, everybody who was tasting Australian wine did get at this winefair. And now I’m sitting here with 2 wines from Australia wondering what happened, of course there are not to much wines available which are cheaper. Look at this labels, koalas an kangaroos, gold an silver, it wouldn’t be a real surprise for me if the sound of a didgeridoo will occur after openning the bottles!! This Shiraz/Cabernet called Kangaroo Ridge, from the Cowra Estate I got for € 2.99. No vintage is told, on the backlabel I got the information that this wine is made by the wellknown winemaker John R. Geber and that this wine is oakbarrel matured. The wine has 13.5 vol% and comes from south-east-Australia. The next wine I bought for € 2.49 it’s a 2005 Shiraz, 14 Vol% and bottled by Wakley Cellars in Yenda. The label tells us also, this wine is coming from South Eastern Australia. Further informations on the backlabel tells us how to use this wine, its recommendet to enjoy this wine while dreaming of a beautyfull sundowner in Australia. I don’t know Mr. Geber, but if I would make wines like this, I won’t let the people know about it, that it was in my charge how this wine tastes. Taste? No, there is no taste, no flavour only a little bit of tannin is left and that’s it. Even € 2.99 are to much for this wine, I will get a lot of better ones even cheaper than € 2.99. There is defintely no need to write more about this wine. Much mor interesting the sundowner Shiraz! Well, if you want to make sure your girlfriend lets you enjoy this imaginary sundowner alone, so this wine is the one you have to go for!! But if you choose instead of a sundowner a meal of game ore pasta you could get some points for choosing this wine. Not to much points, but thinking of the price of € 2.49 this is a quiet good redwine. Redwine, but not Shiraz. There is not to much left over of typicall Shiraz flavours, but still its a wine with nice tannin and a smoth good aftertaste. So I would recommend this wine as common drinking wine, it won’t fit in a Shiraztasting, therefore this wine is not typicall enough. I think the lack af flavour and aroma is of course of maasproduction. I did know, buying wine for this price won’t bring to much enjoyment tasting them. To be honest i did not expect it would be that bad. I really wonder how the Australian wineindustrie will go on in future, of course wines like this will ruin the good reputation Australian wines still have in Germany in only a few years.